This Ford Expedition Max has a strong Twin Turbo Regular Unleaded V-6 3.5 L/213 engine powering this Automatic transmission. ENGINE: 3.5L ECOBOOST V6 -inc: auto start-stop technology (STD), Window Grid Antenna, Wheels: 20 Ultra Bright Machined Aluminum -inc: tarnished dark-painted pockets. Carfax One-Owner. *Packages That Make Driving the Ford Expedition Max Limited An Experience*Trunk/Hatch Auto-Latch, Trip Computer, Transmission: 10-Speed Automatic w/SelectShift, Transmission w/Driver Selectable Mode and Oil Cooler, Tracker System, Tires: P275/55R20 AS BSW, Tire Specific Low Tire Pressure Warning, Tailgate/Rear Door Lock Included w/Power Door Locks, Systems Monitor, SYNC 3 Communications & Entertainment System -inc: enhanced voice recognition, 8 center LCD capacitive touch-screen w/swiping and pinch-to-zoom capabilities (when ordered w/navigation system), AppLink, 911 Assist and (2) smart charging USB ports, SYNC AppLink lets you control some of your favorite compatible mobile apps w/your voice, It is compatible w/select smartphone platforms including Apple CarPlay and Android Auto, Commands may vary by phone and AppLink software, Steel Spare Wheel, Speed Sensitive Variable Intermittent Wipers w/Heated Wiper Park, SiriusXM Satellite Radio -inc: Not available in Alaska or Hawaii, 6-month prepaid subscription, Single Stainless Steel Exhaust w/Chrome Tailpipe Finisher, Side Impact Beams. *Feel Confident About Your Choice *Carfax reports: Carfax One-Owner Vehicle, No Damage Reported, No Accidents Reported. 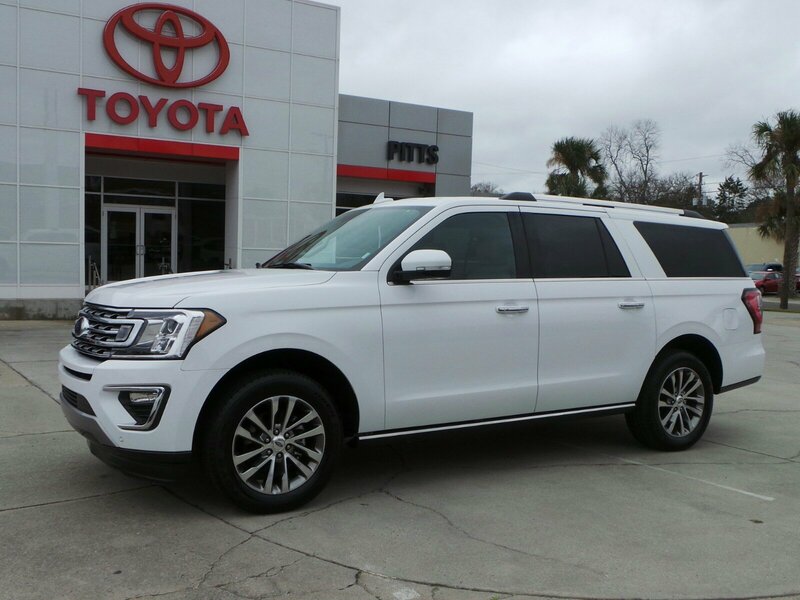 *Stop By Today *Come in for a quick visit at Pitts Toyota, 210 N Jefferson St, Dublin, GA 31021 to claim your Ford Expedition Max!